Uganda coach Milutin 'Micho' Sredojevic admitted his side's exit from the Africa Cup of Nations is tough to take. "This level of competition demands total focus of concentration on details that decide games," said Micho after Sunday's decisive 1-0 loss to Egypt, who scored in the 89th minute. "We have come after 39 years and paid for the lesson in a hard way. "If you lose in a convincing way you accept it, but in this way it is very hard to accept." The result left Uganda bottom of the group without a point or a goal after a previous 1-0 loss to Ghana, and their first appearance at the tournament since 1978 ends in disappointment. Uganda played well against Egypt but they were undone by Abdallah El Said's late strike, which was set up by Mohamed Salah. "We couldn't keep that concentration up to the last moment - when we were supposed to close the game out we allowed a counter-attack and the experience and quality of Egypt's Mohamed Salah made the difference," Micho said. "We came here to play three Cup finals - the first we lost on a penalty to Ghana and the second we lost in the last minute on the counter-attack." 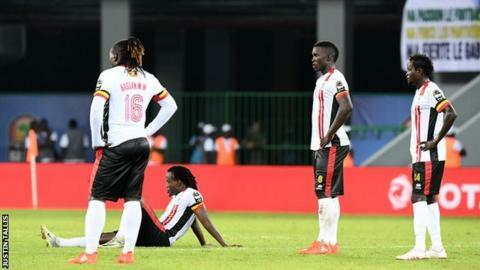 Uganda will now only have pride to play for in their last game, against Mali on Wednesday. "Now we need to pick up the pieces and look forward in order to see who will play the last game - it is hard to say who will play in the last game, we have certain injuries like (goalkeeper Denis) Onyango," said Micho. "We will see how we play the last match but the ambition remains that we want to go home with pride and with a win." Egypt coach Hector Cuper was relieved his side pulled off the win in testing conditions. "We tried to play good football but things perhaps did not turn out the way we wanted them to," admitted Egypt coach Hector Cuper. "It was difficult on that pitch and in this climate but we won and that is the important thing." Egypt will take on already-qualified Ghana in their final match on Wednesday, knowing a point will guarantee their place in the quarter-finals.